« As a second class immigrant, who should I vote for in the Swedish election? It is physics versus philosophy. Causal determinism states that every event is necessitated by antecedent events and conditions together with the laws of nature. Determinism, unlike fatalism, does not require that future events be destined to occur no matter what the past and current events are. It only states that every future event that does occur, is an inevitable consequence of what has gone before and of the natural laws. However inevitability does not mean – and does not need to mean – predictability by the human mind. It should be noted though that the existence of a specific causality does not by itself imply a general determinism extending across all space and all time. A general and absolute determinism is also not a necessary condition for applying the scientific method though it could easily be taken to be so. The scientific method does require determinism but only to the extent that causality applies within the observable range of empirical observations. But it is also therefore unavoidable that the scientific method can only discover causal connections. The scientific method, in itself, rejects the existence of, and is therefore incapable of detecting, non-causal connections. Most physicists would claim that determinism prevails. (Some of them may concede compatibilism but that is just a subterfuge to allow determinism to coexist with free will). Determinism claims that causality is supreme; that the laws of nature (whether or not they are known to the mind of man) prevail in the universe such that whatever is occurring is caused by, and is a consequence of, what came before. And whatever will happen in the future is caused by what has occurred before and what is occurring now. Absolute determinism allows of no free will. It can not. Clearly determinism allows of no gods or magic either. For determinism to apply it does not require that all knowledge is known or that the natural laws have all been discovered. It does however require that everything is knowable. If the unknowable exists then not everything can be determined. It also requires that all natural laws be self-explanatory in themselves. For the physicist, even the uncertainty at the quantum level does not invalidate determinism because this uncertainty, they say, is not random but is probabilistic. Even the weirdness brought about by quantum loop gravity theories do not, it is thought, invalidate the concept of determinism. Here the laws of nature and time and space themselves are emergent. They emerge from deeper, underlying “laws” and emerge as what we perceive as space and time and the 4 laws of nature. Where those underlying “laws” or rules or random excitations come from, or why, are, however, undefined and – more importantly – undefinable. The concept that the universe is a zero-sum game, when taking the universe as a whole, does not take us any further. The concept postulates that the universe – taken globally – is a big nothing. Zero energy and zero charge globally but with locally “lumpy” conditions to set off the Big Bang. Some positive energies and some energy consumption such that the total is zero. I find this unsatisfactory in that the concepts of the universe being homogeneous and isotropic are then a function of scale (space) and of time. Allowing for local lumpiness to exist but which averages to a globally smooth zero, seems far too contrived and convenient. The problem caused by the acceptance of determinism, and of the consequent denial of the possibility of free will, is that all events are then inevitable and a natural consequence of what happened before. Choice becomes illusory. Behaviour is pre-ordained. In fact all thought and even consciousness itself must be an inevitable consequence of what went before. There can no longer be any moral responsibility attached to any behaviour or any actions (whether by humans or inanimate matter). It is argued that morality is irrelevant for physics. They are different domains. There is no equation for morality because it is not a law of nature. It is merely an emergent thing. Morality, for the physicist, just like consciousness and thought and behaviour, merely emerge from the laws of nature. This is not incorrect in itself, I think, but they are different domains because the laws of nature – as we know them – are incomplete in that they can neither explain themselves or morality. For the physicist the natural laws apply everywhere and everywhen. Except, they admit, at or before (if there was a before) the Big Bang Singularity. They apply across the universe except that the universe cannot be defined. It is disingenuous to merely claim that the universe expands into nothingness and both creates and defines itself. The natural laws are said to apply across all of time except that time (not to be confused with the passage of time) is not defined. The nature of time is unknown and probably unknowable. What is it that passes? Quantum loop gravity enthusiasts would claim that time is merely a perception and that causality is an illusion. All events throughout space and time, they would say, occur/have occurred simultaneously. We merely connect certain events in our perceptions such that time and causality emerge. But this is no different than invoking magic. It seems to me that the gaping hole in the determinism charter is that there is no reason (known) for the natural laws to exist. Above all, the natural laws cannot explain themselves. I would claim that this lies in the unknowable. Determinism would have us accept that all biological and neural (and therefore cognitive) processes are merely events that are caused by antecedent events and natural law. Except that while natural laws are observed and experienced empirically, they cannot (and probably never will be able to) explain themselves. The first incompleteness theorem states that no consistent system of axioms whose theorems can be listed by an effective procedure (i.e., an algorithm) is capable of proving all truths about the arithmetic of the natural numbers. For any such formal system, there will always be statements about the natural numbers that are true, but that are unprovable within the system. The second incompleteness theorem, an extension of the first, shows that the system cannot demonstrate its own consistency. We cannot from within and as part of the universe demonstrate why the axioms used by physics must be. Empiricism gives us what we perceive to be the laws of nature. Empiricism also gives us our perceptions of consciousness and thought and free will. And these contradict one another. The resolution of the contradictions lives in the unknowable. Empiricism can only go so far. It cannot reach the parts that empiricism cannot reach. Determinism cannot extend to places where the natural laws cannot or do not reach. 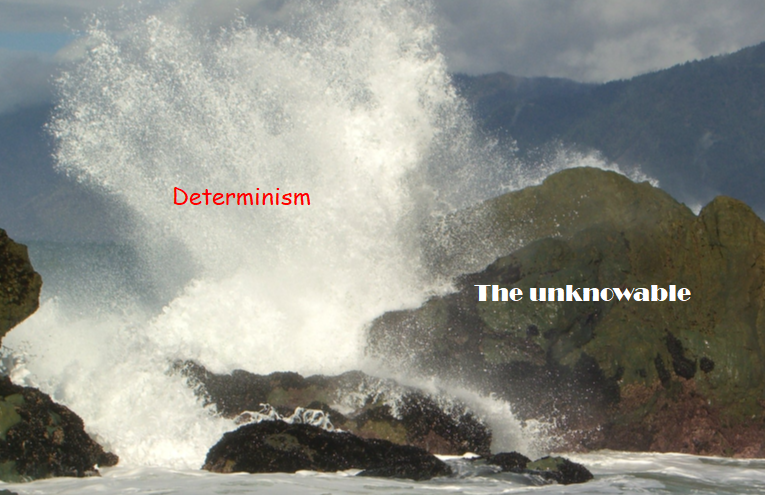 If the unknowable exists then determinism cannot reach there. For the natural laws may not (or can not) apply there. It is not about whether we know all there is to be known about natural law. Determinism requires that some consistent and self-explanatory natural laws apply everywhere and at all times. And the existence of such a set of Natural Laws is unknowable. This entry was posted on August 21, 2018 at 10:47 am and is filed under Philosophy, Science. You can follow any responses to this entry through the RSS 2.0 feed. Both comments and pings are currently closed.